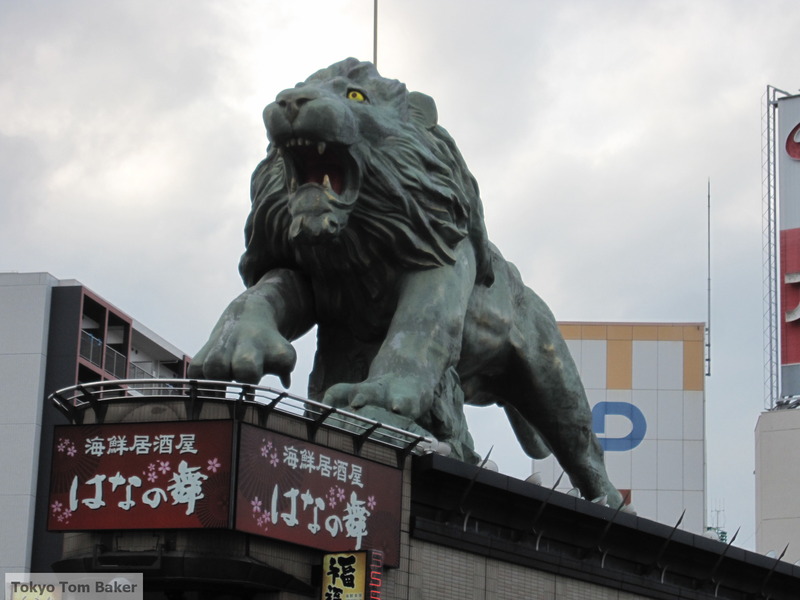 Near the front of shops and restaurants all over Japan, you will see a statue of a white cat (or sometimes a black one) sitting on its haunches with one of its front paws raised as if it were waving at you. This is exactly what it is doing – it’s trying to get your attention so you’ll come inside the establishment to spend some money. 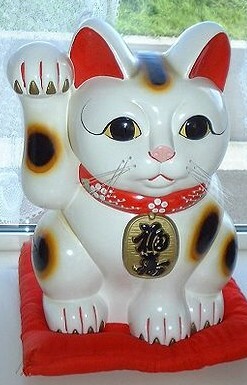 This is maneki-neko, the beckoning cat. Sometimes these effigies are ceramic figurines, and sometimes they are plastic statues that may have a motorized arm that literally beckons. There are various stories about how this ubiquitous mascot came to be, one of which involves a daimyo feudal lord who stopped under a tree in a storm near Gotokuji temple in Tokyo. While standing there, he noticed a cat seeming to beckon from the nearby gate of the temple. As soon as the curious lord went over to have a closer look at the strange cat, lightning struck the tree – a sure sign that when a cat beckons, you had better heed it. I visited this temple some years ago, and saw maneki-neko cat statues in the same profusion that you might see Jizo statues at many other temples. 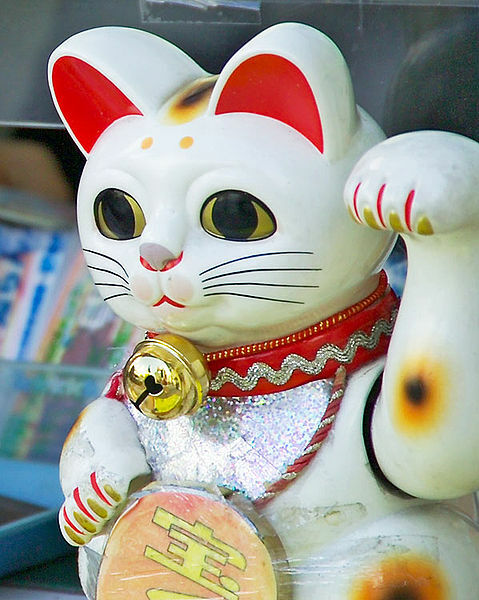 Over time, the maneki-neko pose became so instantly recognizable that even a lot of non-cat mascots do it. In Edward Harrison’s book Idol Idle, about Japanese shop mascot statues, there are photos of a maneki-buta beckoning pig and a maneki-shisa Okinawan lion dog. And in the previous entry on this blog you’ll see a picture he provided of himself posing together with a maneki-neko style photo shop mascot. And needless to say, Hello Kitty has struck the pose as well. But my favorite maneki-neki is one I first laid eyes on back in 1997, when I took up residence in Kawaguchi, just over the river from Tokyo in Saitama Prefecture. This was no mere pussycat, but a ferocious lion. 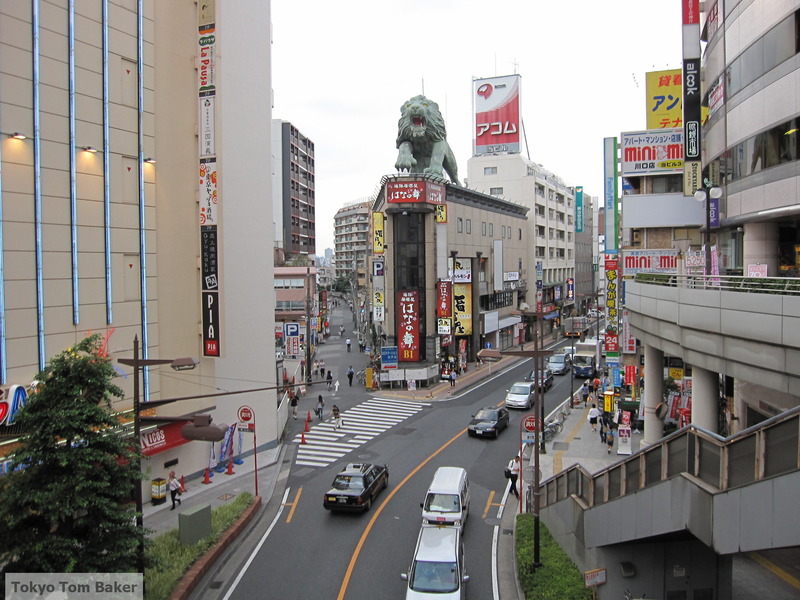 He stands on the roof of a multistory building full of izakaya bars just outside the East Exit of Kawaguchi Station, as if roaring at the crowds of commuters getting off the trains and telling them they need to come inside for a drink. 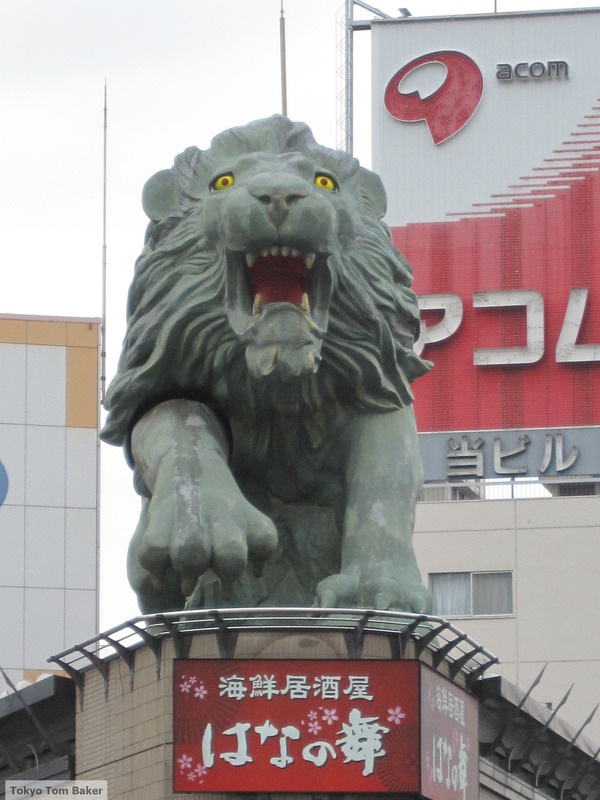 Like any good maneki-neko, the Kawaguchi lion has one paw raised. Moreover, the leg that the paw is attached to seems to be a separate piece from the rest of the otherwise solid statue. In the photos below, just as in the photo at the top of this entry, you will notice a deep, dark seam around the cat’s shoulder joint. With a pint-sized maneki-neko, this means there is a little battery-powered motor inside to make the limb wave up and down. 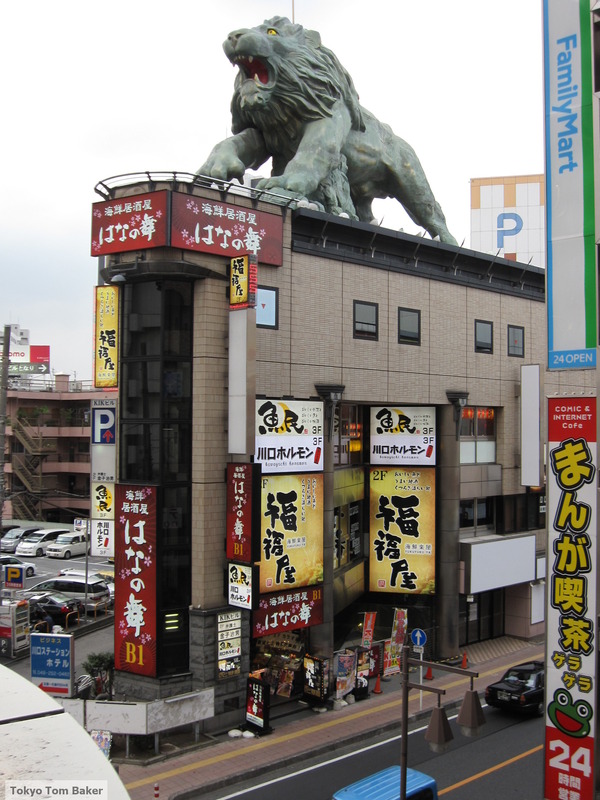 Could it be that the lion also waves his mighty paw from the izakaya rooftop? It sure looks as if someone intended for that to happen. Sadly, though, in the countless times I have looked at this statue from 1997 to the present, I have never once seen it move. Despite my fervent wishes. 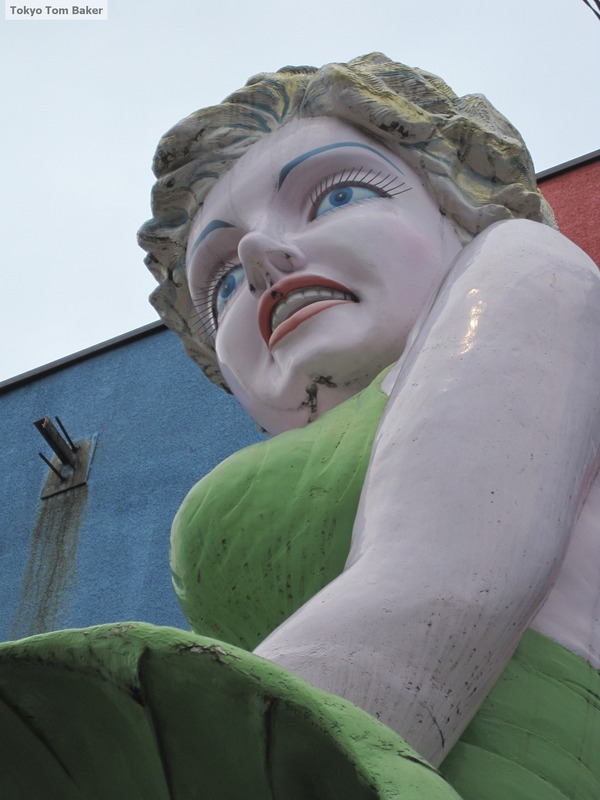 Incidentally, if you continue along the main road past the lion and away from the station, you will eventually find yourself gazing up at an almost equally colossal statue of Marilyn Monroe. I recently interviewed Edward Harrison, the author and photographer behind “Idle Idol,” a book that catalogues many of the countless plastic mascots that stand vigil outside of stores in Japan. They tend to be life-size or much smaller. 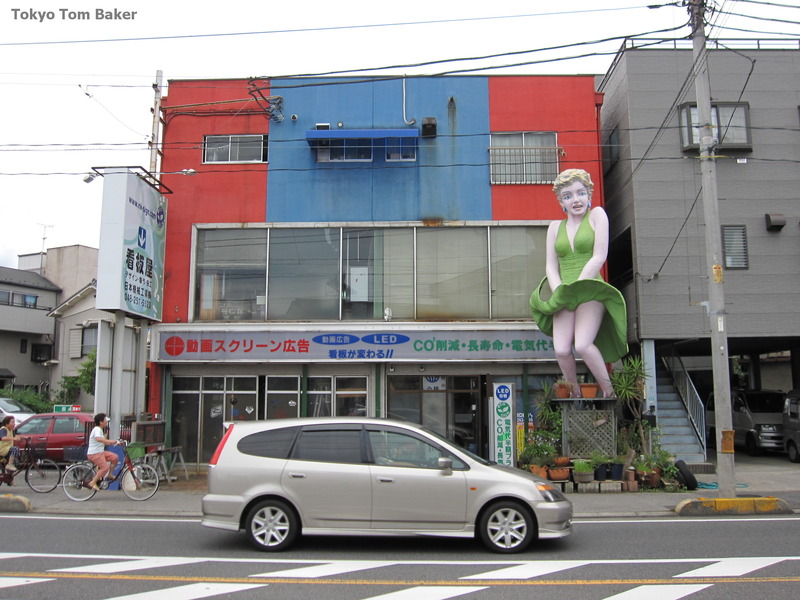 The original Marilyn had her skirt lofted by the wind of a subway train passing beneath a sidewalk grate, but Mega-Marilyn is tall enough to get the same effect from passing traffic in the street. My, what big thighs she has. 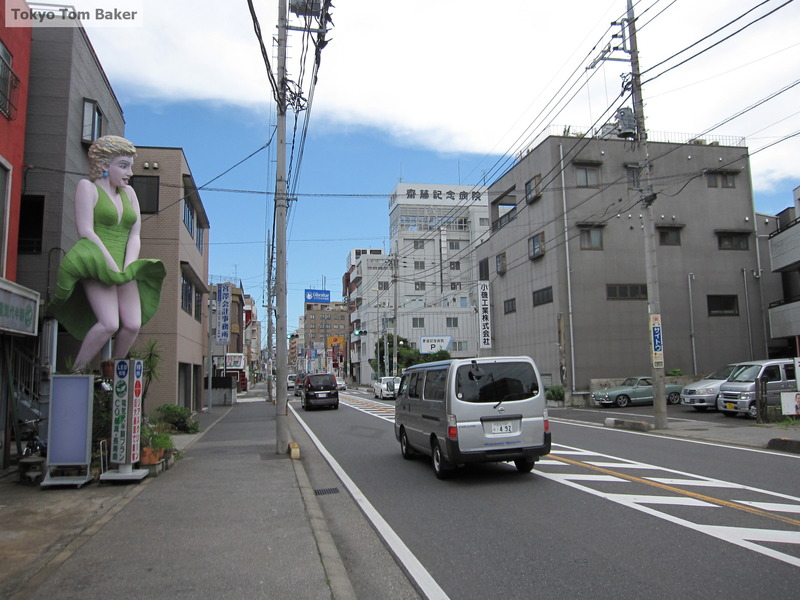 Mega-Marilyn’s job, which she seems to do well, is to attract attention to Nihon Kikai, a local company that makes signs. A photo gallery on the firm’s website shows that much of the work they’ve done for other companies is nicer-looking than the signage on their own building. She’s got legs that could stop traffic. Incidentally, the tall building seen a block away and across the street is a hospital whose rooftop nameplate is another example of Nihon Kikai’s work. Truth to be told, however, she looks a bit more like Princess Diana than Marilyn Monroe. If you find yourself with some time to kill in the Odaiba area (as I did the other week), you might want to pay a 20-minute visit to The Tokyo Port Museum. 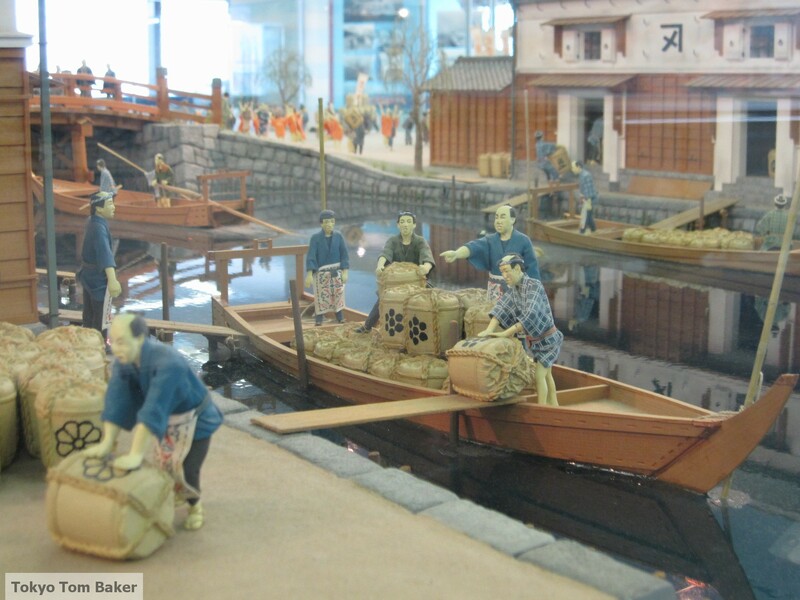 Its main attractions are scale models of the port in the Edo period and today, a bilingual video about the late 1960s to early 1970s land reclamation project that created the container shipping facility at Oi in Shinagawa Ward, and large windows facing in all directions, from which one can see the Oi wharf facility, among other views. There is extensive information in Japanese, but the most the exhibits have minimal English-language explanations as well. The museum occupies most of the 20th floor of the Aomi Frontier Building, right next to Telecom Center Station on the Yurikamome Line. Adult admission is just 200 yen. 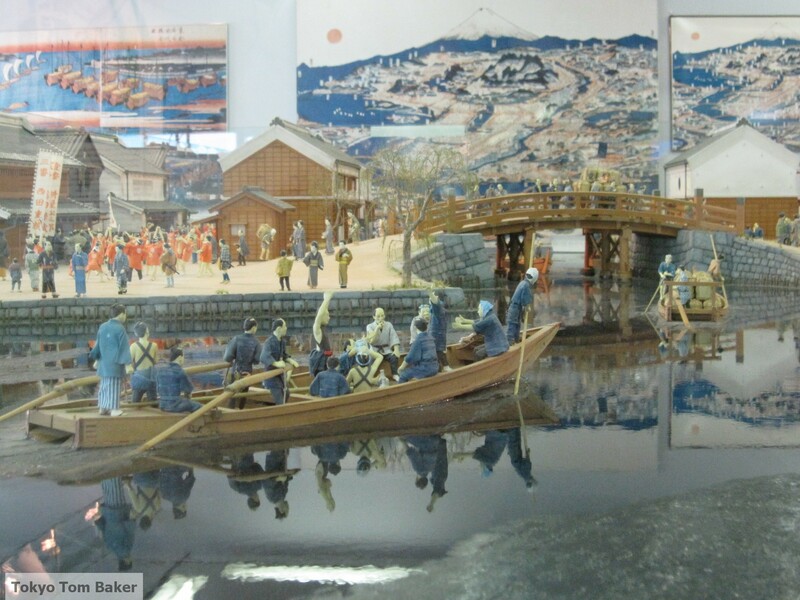 The model of the port in the Edo era is the most impressive asset. 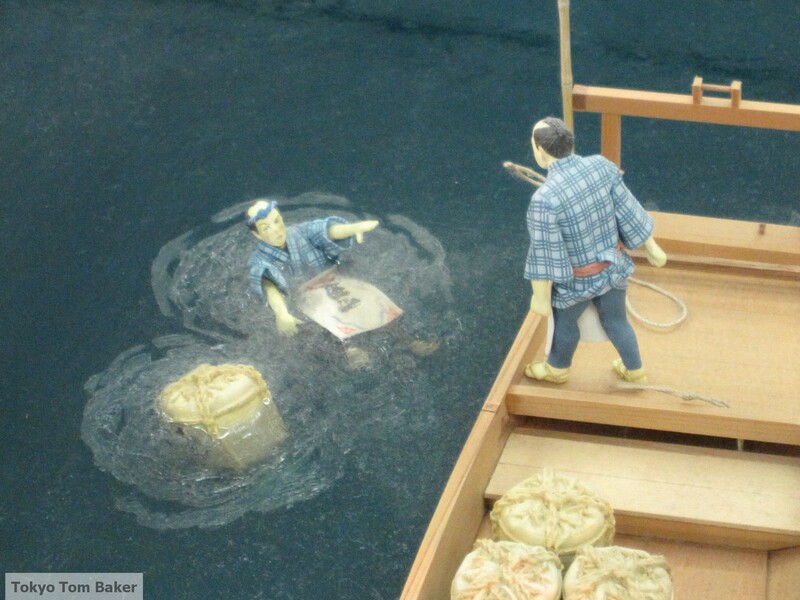 The model makers included several unobtrusive but humorous tableaux, such as this one of a man overboard. If you crouch to view the model from a low angle, a poster on the far wall turns it into a diorama. Sort of. 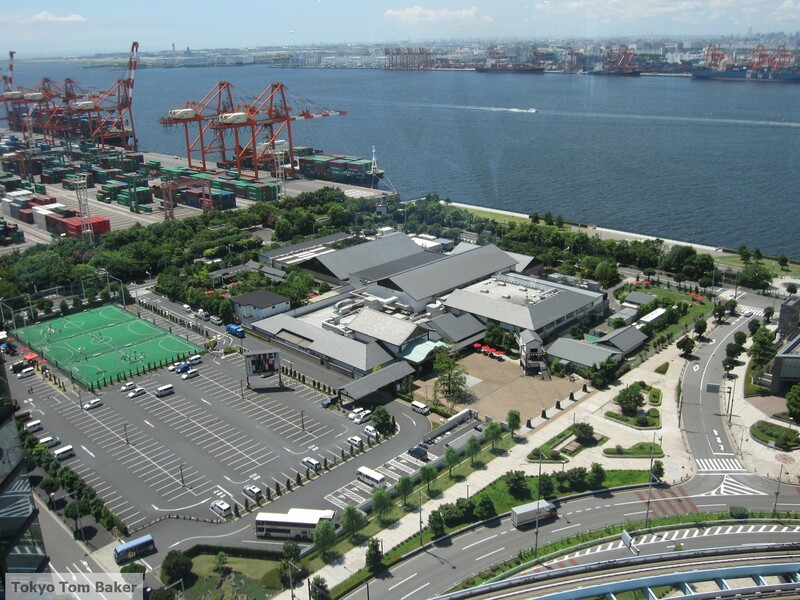 In this view from one of the port museum's windows, the Oedo Onsen Monogatari spa is the collection of low buildings in the center, with a container shipping facility just beyond it, and the Oi container facility on the other side of the water. Berthed at Oi on the upper right you can see a ship from the Mitsui OSK Line, marked MOL. The company was in the news recently when its M. Star vessel (not the one seen here) was damaged in an apparent suicide bomb attack in the Strait of Hormuz on July 28. If you click on the image for a larger view you will see, just left of top center, a plane heading for a landing at Haneda Airport, whose control tower can be seen slightly further left. 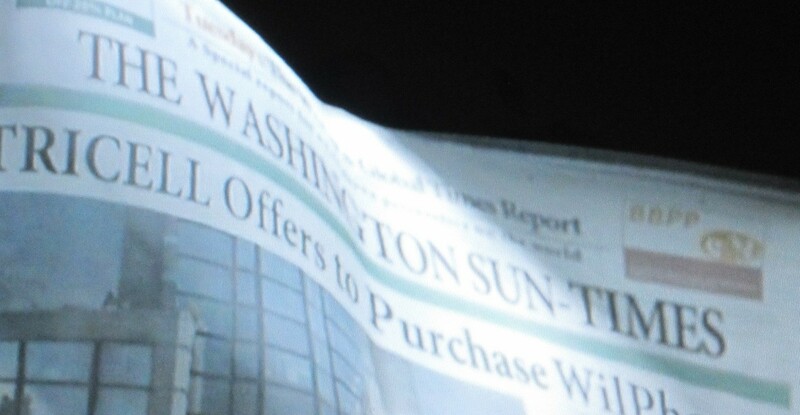 What newspaper do zombie creators read? The zombie-fighting action in the “Biohazard” / “Resident Evil” films is so cartoony that it works better as an actual cartoon. This is basically the approach taken by the movie “Biohazard: Degeneration,” an animated adventure that looks exactly like the video game. There’s plenty of fun in this flick, but my favorite shot by far was the one in which a character is seen napping (or is he dead?) 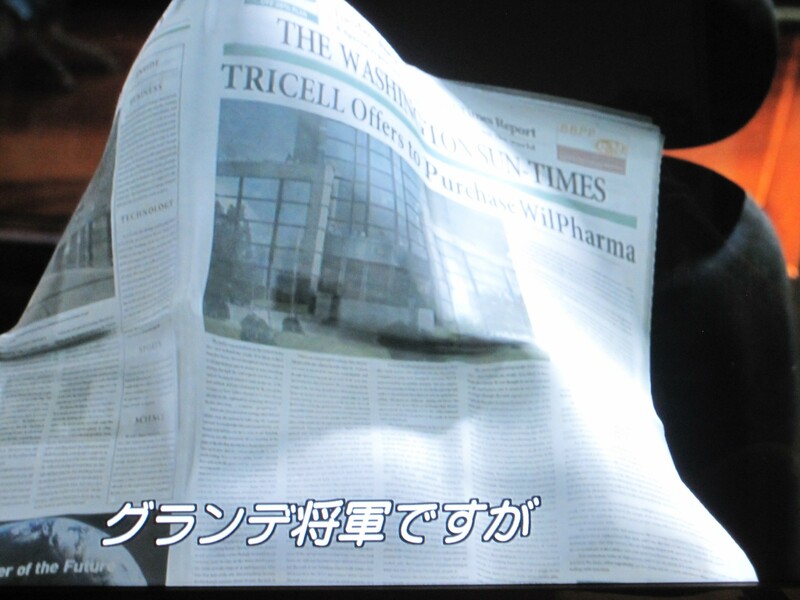 at his desk, with a newspaper draped over his face. 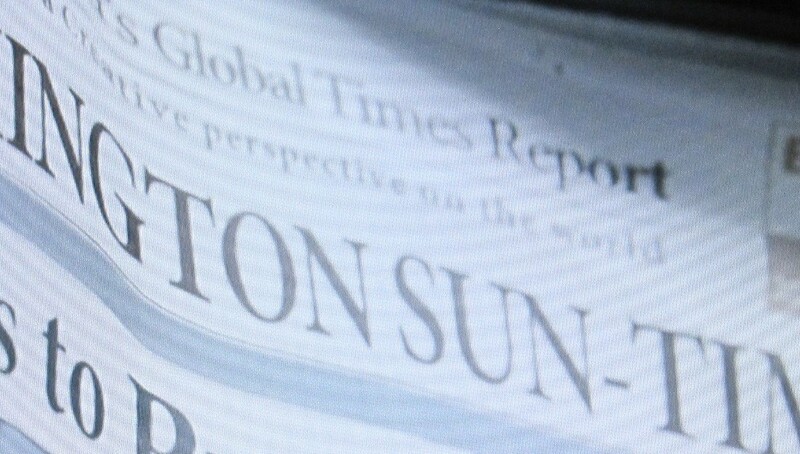 It’s a fictitious newspaper called The Washington Sun-Times, but if you look at the top part of the front page, called the nameplate or banner, you may notice that it bears an uncanny resemblance to the same part of a certain real-life newspaper. (Click on the images to enlarge.) It’s pretty clear that somebody – or many somebodies – at Capcom or their affiliated companies reads my favorite newspaper. Obviously they employ some very smart people. You are currently browsing the Tokyo Tom Baker: The Blog blog archives for August, 2010.